Jen, Jeremy and Tyler in front of the tree that was just lit. 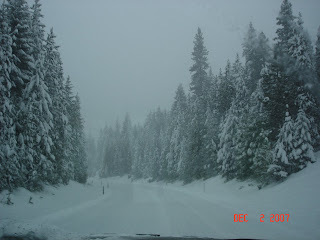 The road our cabin was on. 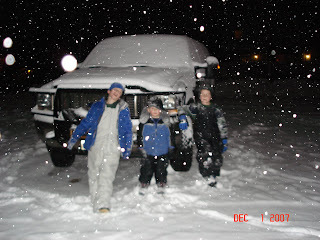 Look at the snow on the hood! A picture of the wise men leading people to the local church. The downtown area all lit up. 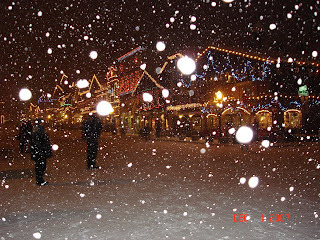 It was snowing like crazy. It was really pretty. 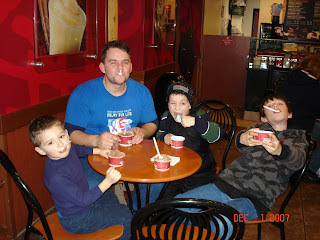 The boys eating some ice cream and goofing off at Cold Stone Creamery. 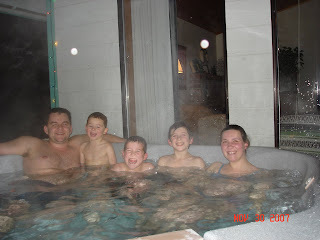 This was us in the hot tub on the porch of our rental house. It was great to sit in it and look out at the snow covered landscape. This was a picture of our car when we returned after the lighting festival. 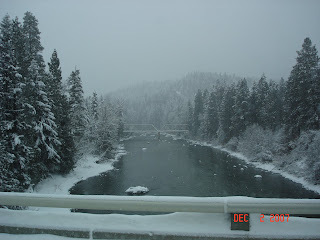 It had snowed a bit while were in town. 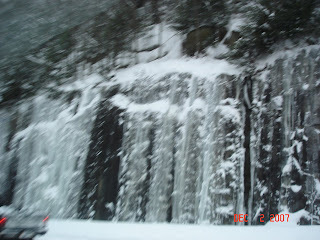 The water froze as it was cascading down leaving beautiful landscape. Road? Or lack there of? 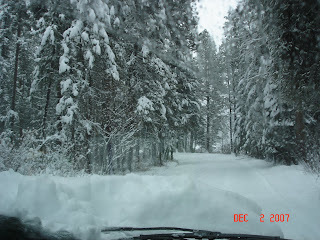 This was the road to our cabin. It was a beautiful drive. Our rental house was near this river. It was really pretty. 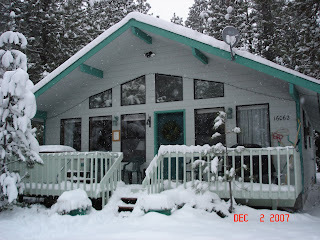 This was our house we rented in Leavenworth. Hot tub on the porch. They had christmas lights up and inside a tree all decorated. It was great. 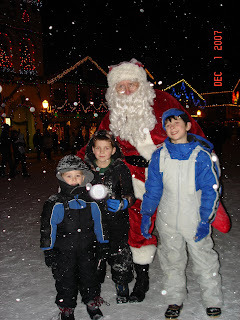 The boys with Santa clause. We just happened to catch him wandering up the street. 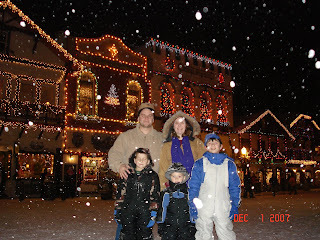 The first weekend in December, we rented a house in Leavenworth, WA and got away for the weekend. 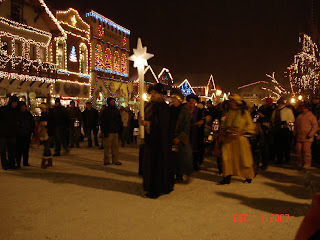 They have a big city wide lighting festival every weekend in Dec. They light the trees and then one by one all the buildings turn on their lights. It was a fun evening. 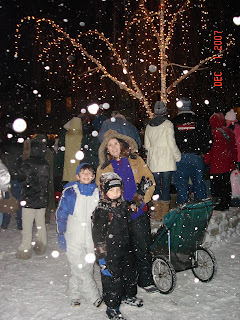 The boys had a snowball fight in the street, they got to see Santa and just had a blast. It snowed pretty hard for a little while which was a special treat as it doesn't do that too often around here. Here is us in front of some shops after the crowd disappeared. 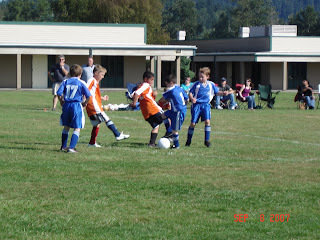 Jeremy getting in there and fighting for the ball. 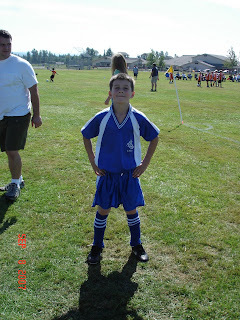 Here is Jeremy all decked out in his soccer uniform. Soccer is his favorite sport. He enjoys it a lot. Tyler on his first day of 1st grade. Both had new teacher's this year. 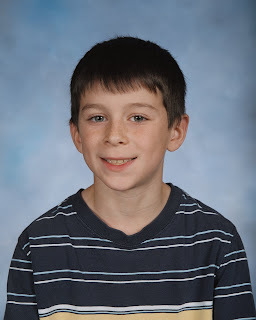 Jeremy continued in IA and went to Mrs. Laybourn and has 15 4th and 5th graders. 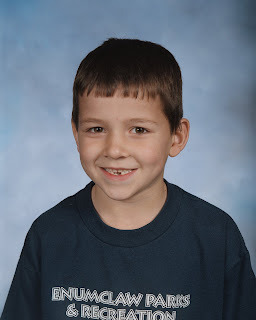 Tyler joined IA and started with Mrs Titus and has 1st, 2nd, and 3rd graders in his class. Elaysha just played with toys and checked to make sure I was still there every once in a while. Ellie was a little freaked out by the ferry. 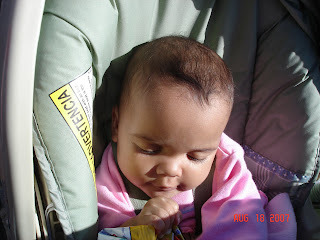 So, a bottle and she fell asleep. 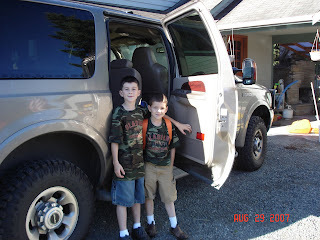 On Saturday, the 18th of August, we decided on a whim to camp at Sol Duc Hot Springs on the Olympic Penninsula. 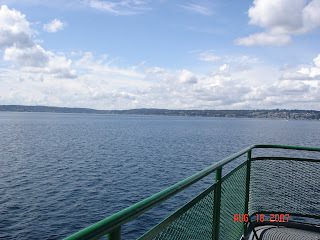 Jen had a meeting in the morning, so I took Ellie and Elaysha and went to my meeting and then took the ferry from Seattle to Bremerton to meet up with the boys. 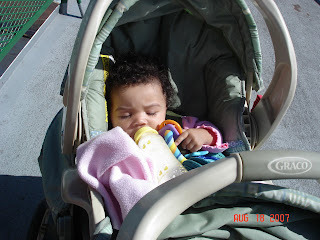 Boy was that a challenge getting that stroller around on the ferry!! 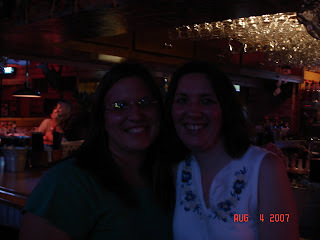 Jen and Amanda at the Texas Roadhouse Bar in Billings MT. We met up and spent the day at Rituals spa having pedicures, massage, facials, and sitting in the steam room. We, also, went to JCPenney's and had our hair done. We spent two nights at the Ramada and went shopping and just spent time without kids and husbands. 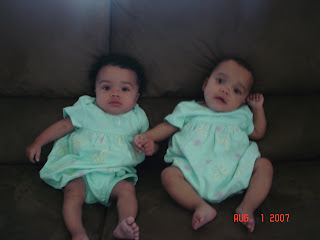 Aren't they adorable in their matching outfits? And holding hands. Dylan took right to his new spiderman bicycle. 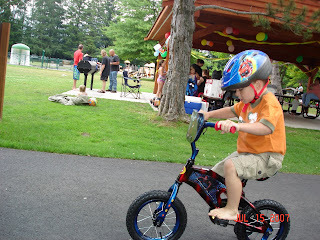 He put the helmet on and within a few minutes he had those pedals figured out and was all over the park. For Dylan's 3rd birthday, we went to the wading pool at Mud Mountain Dam. 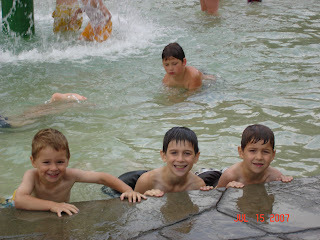 Here is a pic of the boys in the pool.